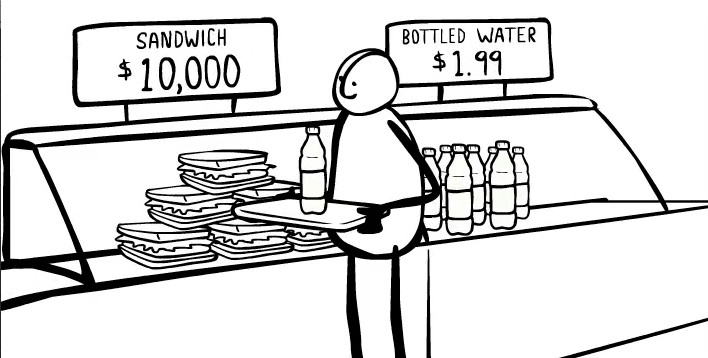 Watch this animated video–you’ll never buy another bottle of water! There are several really good documentaries about the growing scarcity of water worldwide and the boondoggle that is the bottled water industry–Flow: For Love of Water and Tapped come to mind, and you can watch them online–but The Story of Bottled Water lasts only 8 minutes, so you can share it easily. Start it on your iPad or computer at work and friends and coworkers will stop by to watch. Show it to your children or students. Post it to Facebook or Tweet to reach thousands more. It’s from Annie Leonard, of The Story of Stuff Project. 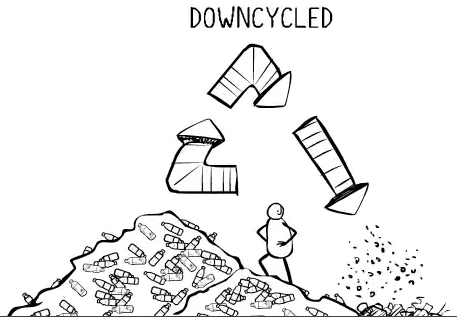 In clever animation of stick figures, it explains how “manufactured demand” pushes a product we don’t need and adds mountains of plastic pollution to our environment. And it has potential heroes: all of those who decide not only never to buy or consumer bottled water but urge others to stop the waste, too. Did you know that buying a $2 bottle of water is the equivalent of paying $10,000 for a sandwich? That’s because of the cost of extracting the petroleum that goes into making the plastic and bottles as well as transporting it and shipping them. By all means organize screenings of the other documentaries–it is really important to stop the incredible waste of resources bottled water represents and to advocate, as Leonard says in the video, for access to clean, safe tap water for the 1 billion people who do not have it. They are apparently working–despite the millions the industry spends on making us think tap water tastes bad and that bottled water (frequently tap water itself) is safer, sales are slowing. This video probably helped. It’s had over 2.5 million views on YouTube. Watch it there if you want to be counted. I was hoping the statewide throwaway bag bill would pass the state legislature because, even though it was not a ban, it would have reduced the number of both plastic and paper bags clogging our waters and parks and provided funds (from hefty user fees collected) to improve the watershed. But at least the Honolulu City Council passed a bill that will first charge fees and by 2015 ban plastic bags in the City and County of Honolulu, which means that Oahu finally joins the Neighbor Islands (Maui, Molokai, Kaua‘i, and the Big Island), in stopping the distribution of single-use plastic bags by retailers–therefore becoming in effect the first state to “ban the bag.” The news site msnbc.com used that very headline: “Hawaii First State to Ban Plastic Bags at Checkout.” For details on this “first”–such as the fact that Hawai’i County’s ban goes into effect in January 2014–and a complete list of what bags are exempt from the ban, read this green-buzz.net post. The time is now to pass plastic and paper bag legislation on Oahu. Plastic and paper bags are not only a nuisance but an eyesore. The bags are so light, they are easily swept up by the wind and blown all over the city, into our streets, parks, streams and onto our beaches. “Ua mau ke ea o ka ‘aina I ka pono.” We need to preserve our precious ‘aina, and get rid of these bags! We need SB 2511, which levies a 10-cent fee on plastic and paper bags, to become law. The benefits? Less litter, which looks bad and costs taxpayers to clean up. Fewer plastic bags fouling streams and ditches, causing backup and flooding. Fewer bags to entangle marine animals. Money saved by retailers because people won’t switch to paper bags, which cost more to produce and use up more resources. The costs? Produce bags aren’t affected, so you can clean up after your pet for free. You don’t have to pay–you can bring your own, as you do at Costco, and as we used to do before plastic bags were the norm. If you want a few to line your kitchen waste can, the fee is affordable. Besides, the fees will go toward restoring and protecting our valuable watersheds. Sounds like a win-win for everyone but the bag manufacturers, who fight throwaway-bag bills everywhere they are proposed. It’s easy to send a letter to the paper. Email directly or fill out a form online so that you don’t forget to give your name and a daytime telephone number. A coalition of environmental groups held a rally at the state capitol Feb. 9 before a senate committee heard testimony in favor of a bill aimed at drastically reducing both plastic and paper bags by charging 10 cents (an “offset fee” rather than a tax or levy) on all single-use bags at checkout. Read about it and see a picture of the plastic-bag monster on the Sierra Club Scrapbook blog. 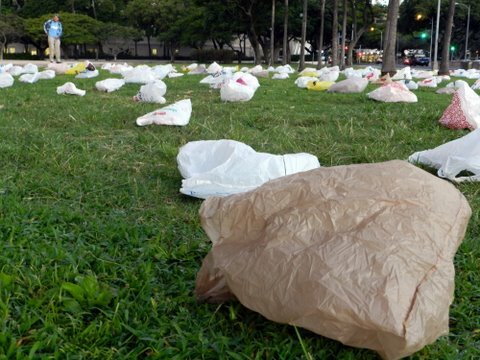 Volunteers littered the Capitol lawn with 400 bags, representing the average number one person uses annually (for less than 15 minutes, on average). It certainly got legislators’ attention (“What’s up with the bags on the lawn?”), and about 50 people testified at the hearing. As with plastic-bag laws elsewhere, the goal is to change people’s mindset, so that they get used to bringing reusable bags to the grocery store or ABC store. If they forget their bags, they will take fewer because of the fee–and refuse all double-bagging. Because this is not a bag ban, revenue will be generated by those who use bags provided by merchants–perhaps as much as $20 million per year, which would go toward restoring and protecting the state’s much-threatened watersheds and rainforest areas. As the Sierra Club’s Robert Harris points out, if people get used to bringing their own shopping bags, there won’t be as much money available, but that will be a sign that the law is working and that plastic pollution is being significantly cut. This helps the environment, but in a different way. The law could come to a vote in a few weeks; if it passes, it could become a national model. Who fights plastic bag laws? The measures have not always sailed into being. When the Seattle City Council passed a 20-cent fee on plastic bags, the plastics industry spent $1.4 million to get residents to repeal the fee in 2009. The Council responded by passing a bill late in 2011 that outright bans plastic bags–not just in grocery stores but in most categories of stores, food trucks, and farmers’ markets. (Paper bags, which waste resources, will cost 5 cents.) In California a group of plastic manufacturers banded together to try to force California municipalities to spend money on an Environmental Impact Review (EIR) of the proposed ordinances, which would have added to costs and delay the legislation. Although the industry’s reps say that they are have the environment in mind in calling for increased recycling rather than banning or taxing the bags and claim that limiting their use hurts shoppers, retailers, and workers (by threatening manufacturing jobs), why are they spending so much money to defeat the bills? The answer to this question, as to so many “why’s” of the anti-environmental movement, is the profit to be made by the manufacturers of plastic bags. Don’t be fooled by an article at the GreenBiz blog by Marc Gunther titled “In Defense of the Plastic Bag” in December 2011; he simply repeats the industry’s arguments and cites a spokesperson for Hilex Poly, a manufacturer with a website called “Bag the Ban,” to back him up. GreenBiz published a detailed rebuttal within a week, by Stiv Wilson. It lays out the case against single-use plastic bags in such detail that it was picked up by the Huffington Post website. Despite opposition, the movement to regulate plastic bags continues to pick up speed, with three states (Hawai’i, Oregon, California) currently vying to be the first to pass a state-wide law. The key to successful implementation is to change people’s mindset, as happened in Ireland. The New York Times reported, “Plastic bags were not outlawed, but carrying them became socially unacceptable — on a par with wearing a fur coat or not cleaning up after one’s dog.” In short, the Irish became more like Portlanders, whose obsessive recycling, re-using, and refusing of single-use plastic is satirized in this clip from Portlandia, a cable series . It’s worth noting that Portland was not an early adopter; the city didn’t even have a plastic-bag law until 2011, but it is a ban, not a charge, and it’s one of a few US cities to have one. The mindset had already changed, so the ban was not a big deal. Visit the website of the Algalita Marine Research Foundation to order a signed copy of Plastic Ocean, the new book by Captain Charles Moore, who discovered the North Pacific Garbage Patch. If you’re on Oahu, Moore will be kicking off a semester of sustainability on the UH Manoa campus center on January 17 at noon. He’ll be talking about his research into the growing amount of plastic marine pollution in the Garbage Patch and the world’s oceans. For Moore’s excellent description of the looming plastic peril he says is a bigger threat to the Earth’s future than climate change, go to Captain Moore on marine plastic pollution, a 7-minute interview that appeared on WGBH Boston in November 2011. The Algalita Marine Research Foundation is one of two nonprofit groups inviting members of the public to join them on a research trip into the Japanese tsunami debris field in May and June 2012. For details, see “Tracking the Debris from Japan’s Tsunami” on the NYT Green blog. Scientists on the expedition will analyze how fast the debris is breaking down and measure its toxicity and how much is being ingested by marine life. They also hope to be able to predict how much of the debris will reach the west coast of North America, whether Hawai’i will bear the brunt, or whether most will end up in the Garbage Patch. For more on the eventual destination see the December post Japanese Tsunami Debris Headed Our Way.